Some of the best athletes in the world. Founders and CEOs. Authors of bestselling books, internationally known fitness gurus, even reality television stars. 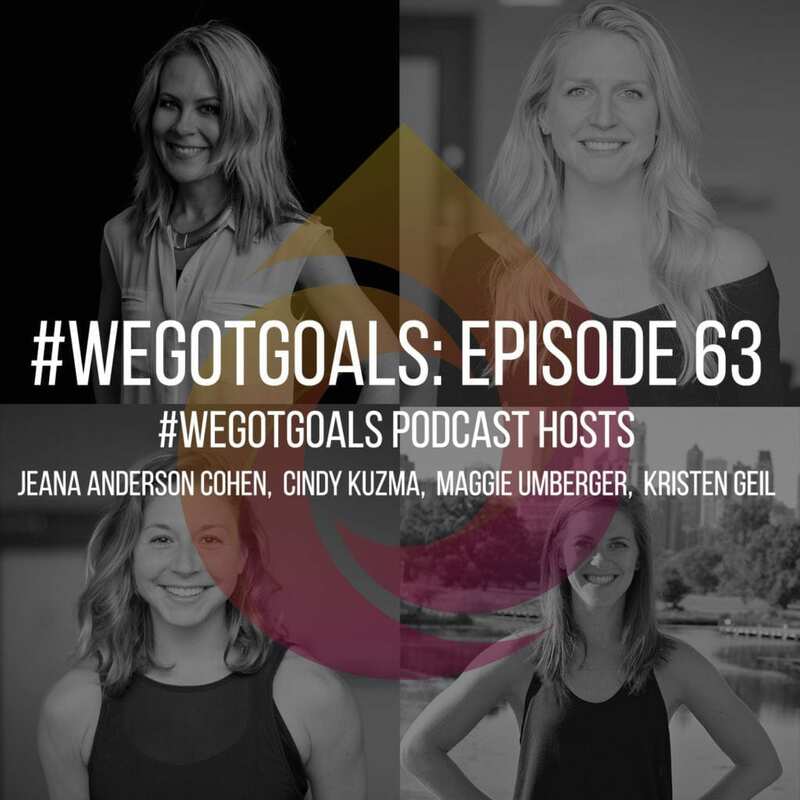 For 62 episodes now, we on the #WeGotGoals team have had the good fortune to interview some pretty impressive individuals. We’ve learned so much about what’s powered them to the top (and we hope you have, too!). But the more goal-getters we talked with, the more something dawned on us. Nearly every single one of them had a failure story, a way they fell short en route to what they viewed as their biggest high. What’s more, they nearly all volunteered to share it with us in a conversation about what was most essential to their achievements. So co-hosts Jeana Anderson Cohen, Maggie Umberger, Kristen Geil and I took a moment to do another guest-less but host-ful episode–we’ll be recording one of these every month or so from now on–to discuss what these failure stories taught us about resilience. Resilience–something Cohen admits she’s “kind of obsessed with” lately–amounts to the ability to recover quickly from difficulties, adapt to shifting circumstances, and thrive despite, or perhaps even because of, setbacks. What enables some people to emerge triumphant from situations that would crush a normal human? Our guests offer us clues. Some leaned on a support network, others took the opportunity to reflect and refocus, and a few stayed laser-focused on a bigger, long-term goal. All, it seems, had incorporated their failures into the narratives that made them the high achievers they are today. We talked through some of the failures that stood out for us over the past year-plus of episodes. For me, it was when Dr. Ari Levy failed his medical boards–then retook them, and now owns a successful practice, SHIFT. Or when Kathrine Switzer nearly got pulled off the course at the 1967 Boston Marathon, but chose to finish instead, and make history. Cohen contrasts these with the story of Lee Kemp. The wrestler made the U.S. Olympic team in 1980; then, the country boycotted the Games. That failure was beyond his control and irreconcilable, and still fuels the way he lives his life today. The setback that stood out for Geil was Jessica Zweig, who’s now the founder and CEO of the SimplyBe agency. Before that, she co-founded Cheeky Chicago–and from all outward appearances, was hugely successful. But inside, she felt so conflicted she eventually became physically sick. For Umberger, Stephanie Johnson’s tale of applying for Survivor for17 years straight–and ultimately getting kicked off before the merge–highlighted the way success and failure aren’t always necessarily black and white. And Maaria Mozaffar, who failed the bar exam five times before moving on to succeed as a civil rights attorney, author, and activist, showed just how powerful persistence can truly be. In the midst of reflecting on what we’d heard from our guests, we shared our own failure stories–career aspirations gone awry, opportunities missed, times we felt like fish out of water. I think we’d all agree those experiences shaped us and led us to where we are today (a spot we all seem pretty pleased with). And, we discussed the ways we’ll continue to build self-care and coping skills into our daily lives so we can nurture our resistance and boost others up along the way. Have a failure story of your own? We’d love to hear it. Share it with us in the comments, or–better yet–record a voice memo and send it to [email protected]. You could be featured on #WeGotGoals in the future. Listen to the full episode anywhere you get your podcasts—including, now, on Spotify! If you like what you hear, please help us spread the word by leaving a rating or a review. And stick around until the end of the episode, where you’ll hear a goal from one of you, our listeners.